It's very commonly known that you can use the Script Wizard in Management Studio to script out tables or even an entire database. 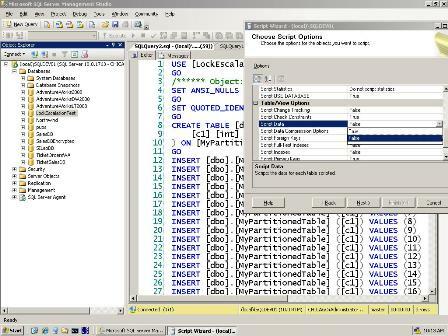 It's NOT commonly known that in SQL Server 2008, the wizard was upgraded and you can now script out the data too. The feature isn't enabled by default, which is why not many people know about it, and I couldn't find it described in Books Online either, further contributing to it's obscurity – but it's definitely there. If you go into the wizard, and go down to the Table/View Options, there's a setting 'Script Data'. Set that to True and you'll get a bunch of INSERT statements in the resulting script too. Very cool. Here's a screenshot showing what I mean (click it for a 1024×768 version). Weekly survey: how often do you run consistency checks? In this week's survey I'd like to know how often you run consistency checks on your *most critical* production database, regardless of *how* you run them (we did that survery already – see Importance of how you run consistency checks). I'll report on the results around July 4th. I'd only like you to answer for your *most critical* production database, as the frequency will probably vary wildly by database, server, production vs. dev/QA and so on. If everyone answers for their most critical database then we won't get skewed results. *Please* no comments on this post – wait for the survey results post to avoid skewing the answers. I'm very interested in your reasoning, but not until everyone else responds. As always, a big Thanks! for contributing to the blog/community by responding. Please shoot me an email (Contact button, bottom left of the blog), or ping me on Twitter (@PaulRandal) if you have an idea for a good survey. PS Thanks to Pat Wright for suggesting this week's topic on Twitter. 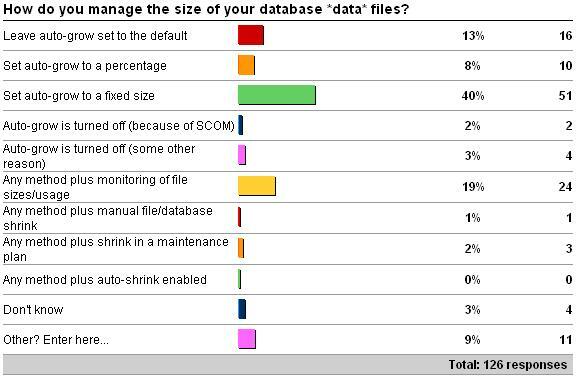 In last week's survey I asked how you manage the size of your database *data* files – see here for the survey. Here are the results as of 6/24/09. As I mentioned in the survey itself, this is just about database *data* files. I covered log file size management in a previous survey – see Importance of proper transaction log size management. There are really four parts to data file size management, which I'll discuss below. The first thing I'll say is that if you're able to, enable instant file initialization on 2005+ – as it will vastly reduce the time required to create data files, grow data files, and restore backups (if the restore has to create data files). We're talking minutes/hours down to single-digit seconds. See Misconceptions around instant file initialization. If you're not one of the miniscule fraction of a percent of customers who have volumes shared between secure file servers and SQL Server instances, turn this on ASAP. 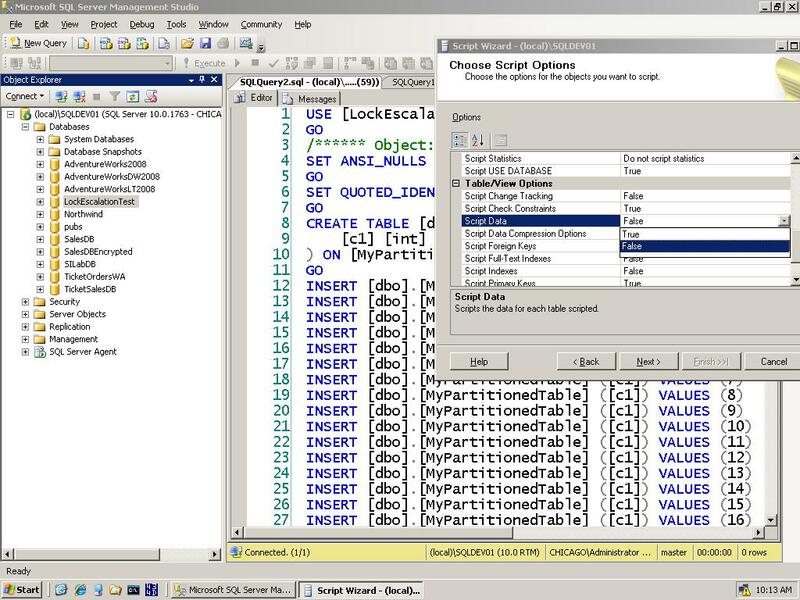 Most DBAs don't know about this feature, but everyone I teach it to or show it to are amazed and then go turn it on. No brainer. Initial data file sizing. This can be tricky. Without getting into the how-to-calculate-the-database-size quagmire, I'll simply say that you should provision as much space as you can, based upon your sizing estimates. Don't just provision for the here-and-now – if you're able to, provision space for the next year's worth of anticipated growth – to prevent auto-growth having to kick-in at all. I rewrote all the Books Online pages for 2005 (links are to the 2008 BOL) on Estimating the Size of Heaps, Clustered Indexes, and Nonclustered Indexes and in the blog post Tool for estimating the size of a database I link to a tool someone put together that codified all my formulas. You can also get sizing tools from hardware vendors too. Data file growth. If you're able to, auto-grow should ALWAYS be turned on, as an emergency measure in case your monitoring fails – you don't want the database to have to grow but it's unable to and then it stops and the application is offline. However, you shouldn't *rely* on auto-grow – it's just for emergencies. The auto-growth default for data files used to be 10% for 2000 and before, but then changed to 1MB from 2005 onwards (log file default auto-growth remained at 10%). Neither of these are good choices. A percentage-based auto-growth means that as your files get bigger, so does the auto-growth, and potentially the time it takes if you don't have instant file initialization enabled. A 1MB autogrowth is just nonsensical. Your auto-growth should be set to a fixed size – but what that should be is a great big 'it depends'. You need to decide whether you want the auto-growth to be a quick stop-gap, or whether the auto-growth will replace manual growth after monitoring. You also need to consider how long the auto-growth will take, especially without instant file initialization. I can't give any guidance here as to what a good number is, but I'd probably settle on something around 10% (fixed), with the percentage steadily falling as the database size grows. It's very important that you have alerts setup to you can tell when auto-growth does occur, so you can then take any necessary action to grow it even more or tweak your settings. 'Other' response #2 is interesting. There's been a 'best-practice' around for a while that the log file should be sized to be a percentage of the data file size. It's totally unfounded and in most cases bears no relation to reality. The vast majority of the time, the size of the log is *NOT* dependent on the data file sizes in any way. Imagine a 10TB database – would you provision a 2TB log? Of course not. Now, I can see special cases where the operations performed on the tables in the database might affect a fixed portion of the largest table in a single batch, and that could generate enough log (with reserved space too) to equal 20% of the data file size – but that's a pretty nonsensical special case, to be honest. You shouldn't use 'set the log as a percentage of the data file' as a guideline. Data file size/usage monitoring. There's a growing movement towards monitoring the data file usage and manually growing the files as they approach 100% full – avoiding auto-growth altogether, but still having it enabled for emergencies. In my book, this is the best way to go as you have all the control over what happens and more importantly, when it happens – especially without instant file initialization. There are some quirks here though. SCOM, for instance, has logic that disables file size and usage monitoring if you enable auto-grow. It assumes that if you enable auto-grow then you're not interested in monitoring. I happened to have one of the SCOM devs in my last maintenance class I taught on the Redmond MS campus and he's going to try to get that logic fixed. Bottom line – make sure you size the data files with some free space, have auto-growth set appropriately, have instant file initialization enabled if you can, monitor file sizes and usage, alert on auto-grows, and don't use shrink. And don't use shrink. Really. Next up – this week's survey!